Help you create timelapse or slow-mo viode at any speed you like. Create up to 100x fast mo and 0.01x slow mo video. You may have seen some time lapse videos already. A sunset motion, flower blooming, traffic and city lights and more time lapse videos. Time lapse is an amazing technique often used to make everything in the video seems moving much faster than in real life, like speed up a video clip and give the illusion of compressed time. If you have a GoPro Hero 5 Black action camera, check our article about how to shoot a time-lapse video with GoPro. Some phones also allow you to shoot time-lapse video, but we recommend you to use a good camera and video editing software to make better time lapse videos. If you are looking for a time lapse video maker, we recommend Filmora9 video editor, which is easy to use on both Windows PC and Mac. 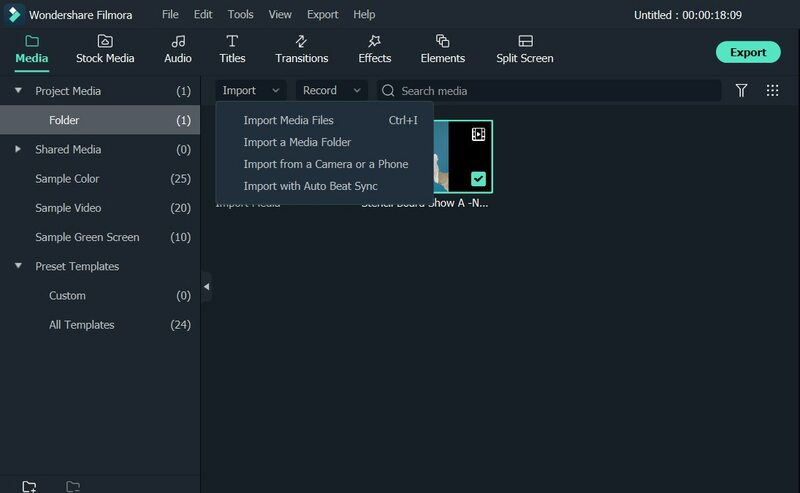 How to create a time-lapse video with Filmora9? Download the software and follow the step-by-step tutorial below. With built-in slow/fast motion effects, you can use Filmora9 to make time lapse effects in drag-and-drop. If you want to add filters to your video, Filmora9 offers more than 150 free filters to use. Check the new features of Filmora9 to empower your imagination. Download it to have a try! Tip 1: Keep the Camera/phone stable with camera stabilizer or tripod. Tip 2: Make sure there is enough space for shooting time-lapse video. Large capacity memory cards are always welcomed. Tip 3: Charge the battery fully before shooting and prepare a standby battery if you have. Just like importing photos to Filmora9, follow the steps to import the video clips to media library. Next, drag your video onto the video column in the timeline. Select the loaded video and click the "Play" button. 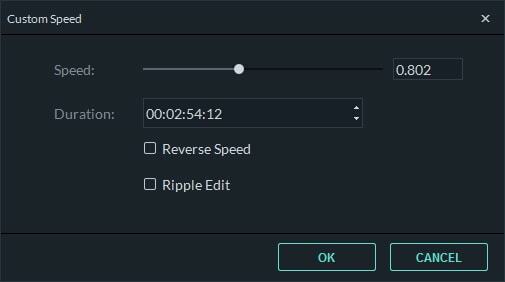 While playing the video, drag the slider bar at the start time and hit the "Split" icon to cut out the part you want to do time lapse editing. Right click on the video clip in the timeline to select Speed and Duration. Then a window will pop up for you to adjust the settings of video. Find the Speed option and drag the slider bar to the right to increase the speed. If you set the playback speed to play at 200% the original speed, then the 30-second clip be only 15 seconds (twice the speed). After that click OK. Click the Play button to preview the result. Filmora9 now support up to 100x fast mo and 0.01x slow mo. If you are satisfied with the newly made time lapse video, just click EXPORT to output the video footage. After installing and launch Filmora9 video editor, import the shot time lapse photos. Click New Project and then click the Import button to add your photos to the media library. You can also directly drag and drop your video to the program. Then all the imported files will appear as thumbnails in the left of the window. You can also import the photos from the video shooting device. Just plug in the video camera, click Import from Phone or Camera option in Import menu, and then transfer the target media files to Filmora9. After that, you need to select and drag and drop all the photos to the first video track. After all your photos are placed in timeline, you can zoom in the timeline or preview it in the Preview window to check if it needs any order adjustment or deletion. Select one of the photos in the timeline and right click on it to select Speed and Duration to open the Custom Speed panel. Go to Duration section, and change the duration of the photo to 00:00:00:01 or other duration based on your needs, and then click OK.
You can also add a background music to make time lapse more professional. You can choose a music sound from the built-in music library or import your own audio file. Place the timeline playhead at the beginner, and play it in Preview window to check the time lapse effects. If everything works fine, click the Export tab and choose the target format and click SETTINGS to output the time lapse video. Here you can change the video format and video and audio parameters such as Bit Rate, Encoder, Resolution and so on. If you want to save and play your video on iPhone, iPod, iPad and other devices, just switch to the Device tab and choose from the device list. 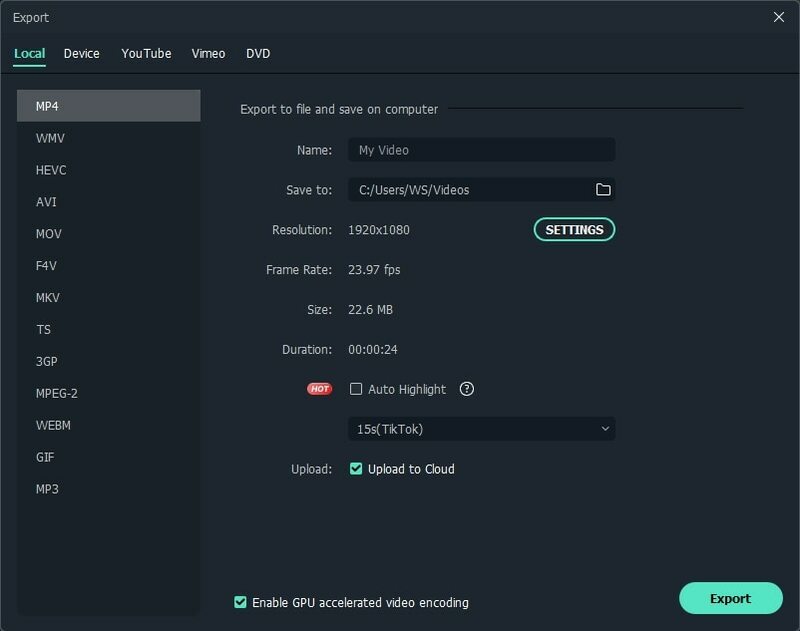 What’s more, you can upload the newly made video file to all popular video sites such as YouTube and Vimeo directly from the interface of Filmora9. Or turn to DVD tab to burn your video to DVD for playing on TV. That’s how to make a cool time lapse video with the time lapse video software Filmora9, no matter whether you want to make a time lapse video from photos, or speed up the video to make a time lapse video, you can achieve that with a few clicks. so i have hundreds of time lapse photos from my gopro all in 4:3 aspect and i want to crop it into 16:9 format now the problem is filmora lets me crop each photo seperately and there is no option APPLY TO ALL..
Come on filmora team... no one said this was wrong? Very disappointed when you call this a time lapse... this is fast forward ok?! I use Filmora wondershare but this is simply a joke. Time lapse and sped up video are 2 completely different things and this is the latter. Its a sped up video. This is insulting, sped up video is not time lapse DELETE THIS!! exactly my thought ... misleading title. That's not actually "time lapse" that's just playing a video at faster speed. Surely, time lapse would be pasting together a series of still images and then creating a video out of that.